The Helix LT guitar processor delivers the highest levels of performance, flexibility, and control in its class. Featuring the same powerful dual-DSP processing and award-winning HX Modeling technology found in the flagship Helix Floor and Helix Rack guitar processors, its streamlined I/O complement and hardware configuration make it more affordable for budget-conscious guitarists who still want to access the power of Helix. Helix LT also makes an ideal backup processor for Helix Floor and Helix Rack owners, as the presets for all three are compatible. Helix guitar processors represent a giant leap forward in modeling technology. Dual-DSPs provide massive power to accurately recreate the sonic characteristics and full dynamic response of classic and modern amplifiers and effects. The Helix HX Hybrid cabs featured in the Helix LT processor represent a new approach to the speaker cabinet capture process. They provide the same resolution and low-end accuracy as a 2048-point or higher Impulse Response, while only using roughly the same amount of DSP power as a 1024-point IR. A choice of 16 different microphones and 12 recording distances provides additional sonic flexibility and real-time dynamic control. 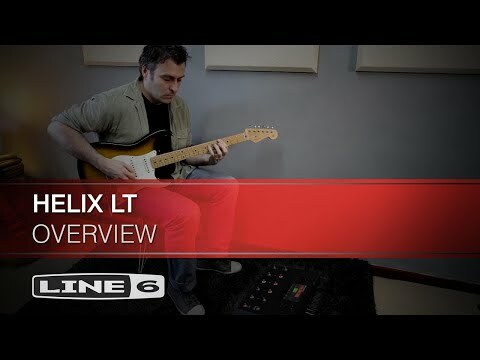 Do you own Line6 Helix LT or have you had a chance to try it?